Quick: When you hear the word “red,” what are the first things you think of? For me, it’s strawberries, lobster, and all the best Starburst flavors. Of course my favorite red stuff is edible. Typical. But my passion for beauty products is right up there next to my passion for strawberry shortcake. So I can’t leave one of my favorite red shades of nail polish off the list — “Lollipop” by Essie. 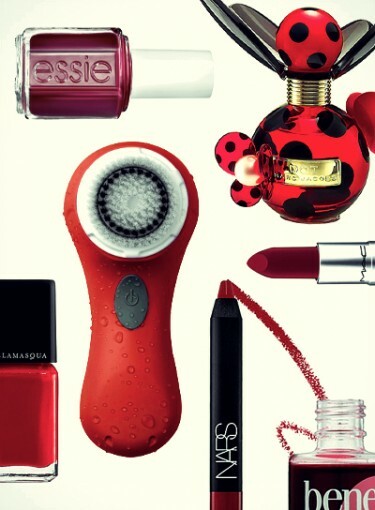 There’s just something about red-colored beauty products that are so memorable. Everyone has got a favorite crimson nail polish or a cherry lipstick. So in honor of Valentine’s Day, I asked my fellow beauty editors what red-colored beauty product is their all-time fave. The red beauty products we came up with are giving us a major case of scarlet fever … and not the kind that Beth from “Little Women” died from. That’s the bad kind. This is the good version of scarlet fever — the kind that makes us want to get all dressed up and paint the town, well, you know what color.